Copy the above code and place it wherever you wanted it to appear. 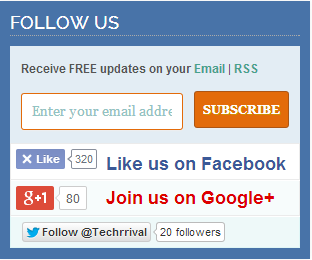 Just replace the URL of the Subscription, Facebook, Google+ and Twitter from Tech Arrival to yours and now you are done. Just simply paste the code where you wanted it to appear. Welcome and keep connected to Tech Arrival…. What of the one they are using now 2018? Hi there – came across your website just now and I wanted to thank you for a very informative article. Sites like yours have been so helpful to me as a newbie webmaster. Thanks for making my work a little easier. You’re the best!